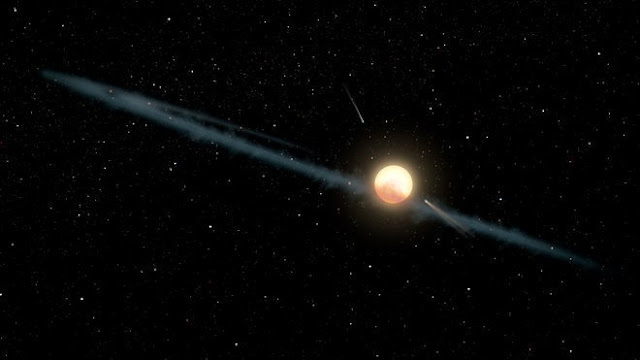 The bizarre long-term dimming of Tabby's star — also known as Boyajian's star, or, more formally, KIC 8462852 — is likely caused by dust, not a giant network of solar panels or any other "megastructure" built by advanced aliens, a new study suggests. "This pretty much rules out the alien megastructure theory, as that could not explain the wavelength-dependent dimming," lead author Huan Meng of the University of Arizona said in a statement. "We suspect, instead, there is a cloud of dust orbiting the star with a roughly 700-day orbital period." KIC 8462852, which lies about 1,500 light-years from Earth, has generated a great deal of intrigue and speculation since 2015. That year, a team led by astronomer Tabetha Boyajian (hence the star's nicknames) reported that KIC 8462852 had dimmed dramatically several times over the past half-decade or so, once by 22 percent. No orbiting planet could cause such big dips, so researchers began coming up with possible alternative explanations. These included swarms of comets or comet fragments, interstellar dust and the famous (but unlikely) alien-megastructure hypothesis. The mystery deepened after the initial Boyajian et al. study. For example, other research groups found that, in addition to the occasional short-term brightness dips, Tabby's star dimmed overall by about 20 percent between 1890 and 1989. In addition, a 2016 paper determined that its brightness decreased by 3 percent from 2009 to 2013. The new study, which was published online Tuesday (Oct. 3) in The Astrophysical Journal, addresses such longer-term events. From January 2016 to December 2016, Meng and his colleagues (who include Boyajian) studied Tabby's star in infrared and UV light using NASA's Spitzer and Swift space telescopes, respectively. They also observed it in visible light during this period using the 27-inch-wide (68 centimeters) telescope at AstroLAB IRIS, a public observatory near the Belgian village of Zillebeke. The observed UV dip implicates circumstellar dust — grains large enough to stay in orbit around Tabby's star despite the radiation pressure but small enough that they don't block light uniformly in all wavelengths, the researchers said. "Up until this work, we had thought that the star's changes in brightness were only occurring in one direction — dimming," Simon said in a statement. "The realization that the star sometimes gets brighter in addition to periods of dimming is incompatible with most hypotheses to explain its weird behavior." You can read the Simon et al. study for free at the online preprint site arXiv.org.